any of the smallest lobules of a compound gland. liver acinus the smallest functional unit of the liver, a mass of liver parenchyma that is supplied by terminal branches of the portal vein and hepatic artery and drained by a terminal branch of the bile duct. 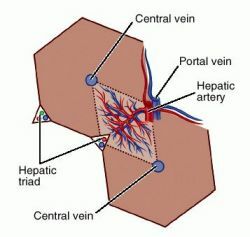 Liver acinus: Hepatic lobules are represented by hexagons (solid lines); liver acinus is represented by rhombus (dotted line). From Dorland's, 2000.
pulmonary acinus terminal respiratory unit. One of the minute grape-shaped secretory portions of an acinous gland. Some authorities use the terms acinus and alveolus interchangeably, whereas others differentiate them by the constricted openings of the acinus into the excretory duct. /ac·i·nus/ (as´ĭ-nus) pl. a´cini [L.] a small saclike dilatation, particularly one in a gland; see also alveolus. 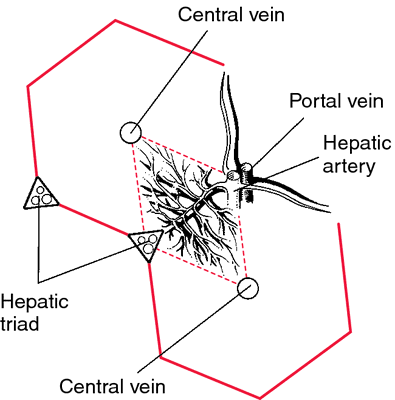 Liver acinus: hepatic lobules are represented by hexagons (solid lines); liver acinus is represented by rhombus (dotted line). pancreatic acinus one of the secretory units of the exocrine pancreas, where pancreatic juice is produced. thyroid acini see under follicle. One of the small saclike dilations composing a compound gland. 1 any small saclike structure, particularly one found in a gland. A small, sac-like out-pouching of a compound gland, as in the breast, pancreas, salivary glands and thyroid. A sub-segmental lung structure which, with the primary pulmonary lobule, is the smallest unit of lung tissue. It consists of a terminal bronchiole and the lung parenchyma that arises from it. 1. The part of the air passage of the lung beyond each of the smallest (terminal) bronchioles. There are about 12,000 acini in each lung. The lung ALVEOLI arise from the acini. 2. Any terminal sac-like process of a compound gland. the terminal sac of an alveolar gland. The gland has a multicellular structure with sac-shaped secreting units. In the pancreas, acinar cells secrete the PANCREATIC JUICE. One of the minute grape-shaped secretory portions of an acinous gland. n 1. a saclike cavity present in a gland or the lungs. 2. a group of secretory cells of the salivary gland. n a group of serous cells producing serous secretory product such as in the salivary glands. pl. acini [L.] any of the smallest lobules of a compound gland. the smallest functional unit of the liver made up of two wedge-shaped masses of liver parenchyma that are supplied by two neighboring branches of the portal vein and hepatic artery and drained by two central veins and by terminal branches of the bile duct.